Rewe offers an online grocery delivery service in 75 German cities and plans to roll it further out thanks to the co-operation with independent shopkeepers. Schwarz Group's Kaufland, meanwhile, discontinued its service offered in one single city, Berlin, after just 444 days. 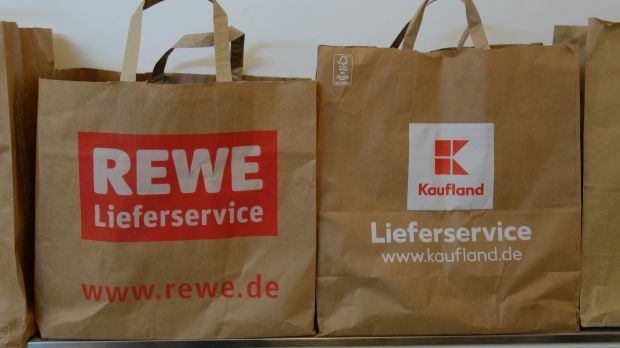 Rewe is actively trying to make grocery e-commerce palatable to its independent shopkeepers. Lebensmittel Zeitung has learned that the owners of Rewe supermarkets in Germany will be offered financial aids to implement click & collect options in their stores or co-operate with the hitherto centralised home delivery service. The regional divisions of the Cologne-based co-operative have actively approached their members with materials offering information and personal support. Click & collect is currently available in around 65 stores, and home delivery in 75 cities. For the centralised online grocery delivery service, a common IT platform similar to competitor Edeka’s Olivia is reportedly being built. Some independents already run proprietary services, taking orders via mail, phone, fax or order forms. Sophie Kamp has recently been appointed District Manager for the delivery service of independent shopkeepers, a newly created position. Rewe Group wants to invest massively in what it calls “digital transformation”. It is currently constructing an automated warehouse for home deliveries, with other distribution centres being constructed in Mannheim and Hannover. Perhaps there was sigh of relief audible in Cologne at the end of last year, when Kaufland, following on the heels of its sister Lidl, said it would discontinue its online grocery operation. Kaufland said it saw no way to turn the venture profitable “in the foreseeable future” – a venture consisting of a home delivery service that it had installed with big fanfare in Berlin just a year earlier. A sigh of relief, not because it was unprofitable – that’s widely known and the case for all. But a sigh of relief because this could mean that none of the price-aggressive formats in Germany – neither the discounters nor Kaufland – would try to interfere in home deliveries for the time being. This would leave room for Rewe and Edeka to develop true supermarket-style, 'value-added' online services with no need to focus on self-harmingly low prices. This could include what looks like a slight change of mind: Only last year, when Lionel Souque took over as CEO from his predecessor who drove grocery e-commerce aggressively, the focus on the online channel seemed to have faded a bit. Only to be reassured now again, and consistently enough, that the company's strategy focuses on the independent shopkeepers who have found a great advocate in Souque. For a supermarket service like Rewe, it is imperative to involve shopkeepers, not least because main competitor Edeka has far more of them and will therefore be forced to push ahead a solution with their involvement. Interestingly Rewe is far more advanced in grocery e-commerce than Edeka when it comes to the roll-out of its services, both click & collect and home delivery. However, Edeka already has the software platform for its independents and their potential online shops. But the number of pick-up and delivery services is more than limited, and the independents know well why. Click & collect obviously is the less unprofitable solution, at the same time it is probably less attractive for German shoppers. (Souque’s predecessor, also a Frenchman, opined about its unacceptance compared to French consumers.) By contrast, grocery home delivery is the even more unprofitable option, yet more attractive. It seems unclear as of yet how home delivery should be managed by independent shopkeepers, in terms of product availability, order picking and actual home delivery with sufficient staff and fleet to cover peaks. Not to mention that independents would prefer their customers to visit their stores anyway. In general, wouldn’t the Rewe approach mean the independents will have to do the work that the centralised operation is incapable of? Will they eventually have to foot the bill of a concept that will never be profitable, “in the foreseeable future”? Eventually, will the shoppers have to pay for the folly? It’s all a question of money. The independents don't have to participate, they are independents. They will get their service ‘gold-plated’ by the headquarters if they negotiate successfully. This is because the Cologne team is extremely interested in getting the service going, eventually nationally, and this is why they have earmarked big money for it. Even if for the mid-term, the fear of Amazon Fresh, Kaufland, Lidl etc. has been appeased, Rewe wants to be prepared for whatever is to come.